Written on August 31, 2006 by Kevin. My wife quickly became an Ikea nut after our first visit. It sometimes seems like we are there every weekend picking something up. On a trip a while back we picked up the Ikea Mata set. For a whopping $3.99 you get all that is pictured below. We couldn't pass it up. We were familiar with bucket bibs similar to this and we had good experiences with them. While many bibs can easy be pulled off by Rylan due to poor Velcro, this one holds up pretty well. After a bit of use, Rylan doesn't seem to mind it and it does its job pretty well. Crumbs are now collected before getting to the floor allowing Rylan to dig for treasures in the bottom of it. He will clean his table of food and then move onto the bucket. The frog bowl is large and can easily hold a full serving for Rylan. Some of our bowls can't have the same said. The bowl does come with a suction cup to help hold it in place. We have yet to use this as we prefer to just hold the bowl ourselves. It may be difficult to tell by the picture but the spoon is not your normal shape. At first, I found it a bit difficult to get used too but overtime it has grown on me. It seems to make feeding Rylan while his head is turned a bit easier. I guess there may be a reason for their awkward shape. We have not used the cup too much. For the most part, it appears to be your standard sippy cup with no extra features to help prevent spills. They have designed it with a slope to allow for children's noses and so that you don't have to tilt it back as far. When Rylan takes to cups more we will try using it more often but until then, it sits on the shelf. Like many other things you find at Ikea, this set is pretty well planned out and is definitely affordable. The ability to catch a bit of food and save that little bit of money tells me that it will eventually pay for itself. The rest of the set is just a bonus in my book. Written on August 29, 2006 by Kevin. My wife and I were out driving the other day and I noticed a minivan with those family stickers on the back. I am always a bit curious who is driving a minivan. I guess you could call it competition of fatherhood. When I ended up pulling next to the minivan, I noticed a baby. A baby in the front passengers lap standing there. 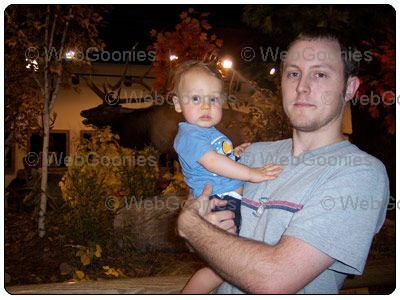 I am terrible with judging ages but I would have had to guess that the baby was about 9 months old. I have seen this in the past here and I imagine most other people have as well. No one will ever be able to explain to me a good reason why you shouldn't have your child buckled up. I fully understand that a crying baby can likely be soothed if you pick them up out of their car seats but the cries of a baby in an accident would be much worse. I called up the non-emergency police here and they patched me over to a different number. This number was 1-800-505-BABY. It is a local number here in Arizona for people to report children that are not properly in car seats. They ask for basic information such as the license plate number, city and where the child was sitting. After calling them up and giving them the necessary information, I wondered what may happen with these parents. Would they get fined? After getting home I researched the service a bit further and found that they do not actually fine these parents. The service sends a notice to the car owner stating that they were seen driving with a baby not being restrained. They receive a package full of information to explain why it is necessary. People must understand that it is not safe, how is a packet of information going to help this? Why are these parents not fined? I will never understand this. Never the less, I am now on a mission to find other children in this situation and report the drivers. I have since programmed the number into the cellphone and certainly will be using it often it seems. I am still very curious if other states have this issue as commonly as I see it. I would suggest checking with your local state officials to see if they have a similar number to report situations like this. I guess it may save a few lives or atleast teach the parents that people are watching them. Written on August 28, 2006 by Kevin. Despite a few stormy nights, its been a normal terrible summer here in Arizona. Regardless of what people tell you, it takes a toll on you; especially when you need to drive in it. We drove up there to cool off and enjoy the views and of course my wife went for the shopping. Rylan did great. We were able to eat at a nice restaurant with minimal problems. He kept occupied by eating his lunch and checking out all of the people. We were really happy with the whole lunch. 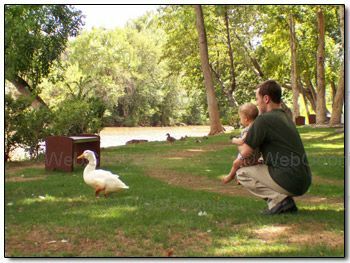 We took Rylan down to the river where they have a nice grassy area that is frequented by ducks and geese. We knew Rylan would like this and he did. 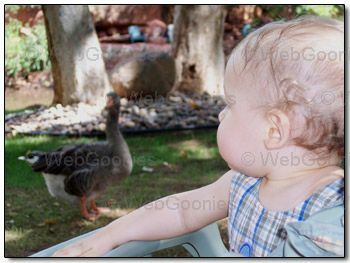 I have heard stories of these geese chasing after people but they kept us alone this time. Of course, we had no food for them. We decided to turn our day trip into an all day trip. We took a drive from Sedona to Jerome. Jerome is an old miner town that is built on the side of a mountain. I had never been there so when one of the shop owners recommended it, we took her advice. I was hoping that it was the old ghost town they had on the Brady Bunch years ago but I don't think it was. I really need to track that place down. I am pretty sure it was filmed here in Arizona. We didn't stop here and decided to pass through it instead. It was amazing to see buildings basically sitting off the edge of a moutain. The historic value of this town is great and I would really like to go back when we have some more time. We finished off our day by driving all the way to Prescott. Unfortunately, by the time we got there, all of the good shops were closed up. They have some very unique stores including a baby store that my wife always seems to talk about. They have items that we have just never seen before. Prescott is another place that has a small town feel and is certainly a place to check out. The courthouse they have looks nearly identical to the one in the Back to the Future movies. It's nice to get away from everything for a weekend and this certainly was a great Saturday for us. Rylan did great and we couldn't have been happier. Despite my wife thinking I am some nut, I have been working on learning minor photography. 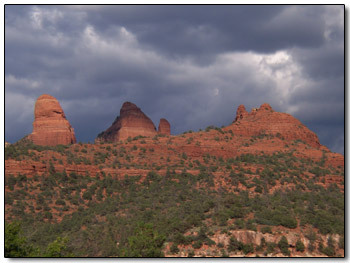 Here is a photo of the Sedona scenery that I took, I think it turned out pretty well. Written on August 25, 2006 by Rylan & Kaitlyn. Ya know, not too much has gone on this past week. I have mainly just been working on my standing and eventually walking. I haven't really taken my first step just yet but I will soon. Mom and dad encourage me but I need just that.. courage. It's just a matter of time though. It's going to be really funny to see mom and dad's face when I take that first step. Oh boy oh boy. Remember that BuggyBagg that my dad mentioned a few months ago? Well it broke. One of the clippy things broke in the back but dad talked to them and they are sending out some replacement parts so that's good. Apparently its a fairly common issue so if anyone you know has a BuggyBagg, you may want to get a replacement part just in case. We went to the park yesterday and I had my first try at a swing. I have mixed reviews on it. At first, I didn't mind it and I liked daddy playing with me but a little bit after that I began to get worried. Maybe I shouldn't look down next time. We checked out some of things at the park but they only had slides. It wasn't that good of a park. Daddy needs to hunt for the ultimate park! I guess that is it for this week. I think we will be going to see my great-grandparents this weekend so that should be fun. I know that they get a kick out of it when they see me. Have a fun weekend. Written on August 23, 2006 by Kevin. As mentioned in the past, Rylan has been sitting with us recently at the dinner table while we eat. In the past, we would have to feed him separately or give him one of his teething biscuits or toast. This worked as a distraction but wasn't a full meal for him to eat up. 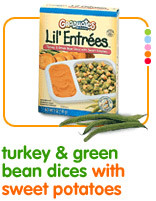 We are now using the Gerber Lil'Entrees to help Rylan learn how to self feed. We were a bit confused by these types of finger foods at first because they say that children who are able to pickup things with their thumb and finger should eat them, otherwise continue to feed from a jar. Rylan never had an experience picking up small things like this but we decided to give it a try anyways. At first, he obviously had no idea what to do but as the weeks have gone by, you can clearly see he knows what to do. Just the other day, while at his grandpas house, he ate the entire entree with very little on the floor. He now eats most of the food with his 2 fingers. There are times, like last night, where he just isn't in the mood to self feed so the food either goes on the floor, or we have to feed it to him. This is OK to us and we understand its a process. Why feed yourself when you can have someone feed you. There isn't much better than watching your child progress and learn new things. It amazes us how intelligent he is at times. We were lucky to have picked up a massive amount of these for super cheap as a local grocery store was closing down. We only wish that more stores will be closing because we were really spoiled by the price. It always helps to have a helpful grandpa willing to pitch in as well. I know that Rylan certainly appreciates it. Fisher Price or Ikea? You decide. Written on August 22, 2006 by Kevin. My wife and I have been able to enjoy dinners more often now that we have Rylan sitting at the table with us. He keeps himself entertained by feeding himself different types of foods. This is a huge improvement over the past where Rylan would ache for attention. He must feel in the crowd as his need for attention has dropped significantly. With self feeding has come a messy kitchen. Rylan certainly won't win an award for the cleanest baby when it comes to feeding. However I must say, he does do well with some of the foods. Other times, 50% of the time he gets it in his mouth and the rest of the time he has it on the floor or himself. (Another day, I will be reviewing some of the bibs that we have and enjoy.) The food on the floor is easy to clean up but the food that gets stuck in his Fisher Price Aquarium Healthy Care High Chair is no easy task. While the high chair does have some advantages, the process of cleaning it is a pain. Even cleaning the dishwasher safe tray can be a pain sometimes (call me lazy). We needed something new. Welcome Ikea. My wife's new favorite place. We have been there a few times in the past month and finally decided to give the Ikea Antilop High Chair and tray a try. We decided on this as it is sturdy, super easy to clean and can be tucked easily into a car for mobile use (legs come off). We have used ita few times now and have been really happy with it. Rylan can watch us from all angles now as there is no high back blocking his view. He is given a large tray area for him to make as much mess as he wants. The high chair is nearly a solid piece of plastic so we were unable to find any sharp edges. This thing is really made with minimal in mind but also children in mind. It works, well. 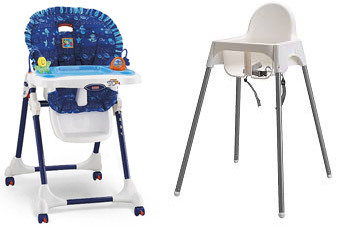 The Fisher Price high chair did have attachable toys but we think the payoff is worth it. Suction cup toys can be purchased another time if Rylan needs such a thing. For now, Rylan can play with his toys that we put onto the tray. As for being mobile, we used the Ikea high chair last night at Rylan's grandpas house and it worked out great. It kept him occupied as the rest of us ate. This was something we never could have done with our old high chair. We only wish we could have picked up the Ikea Antilop sooner. I would highly recommend this high chair and for the grandparents out there who want a place to sit their grandchildren when they are visiting, this works out great. Easy to assemble and hides away when you don't want to see it. For nearly 1/3rd of the price of the Fisher Price, I don't see how you can go wrong with this. Written on August 18, 2006 by Rylan & Kaitlyn. How many people got to see Brother Bear 2 in theatres? Not too many I tell ya. Mom was given the chance to see the movie because she is a Disney Movie Club member. When she got rejected an offer because they had filled up, we were pretty bummed. This was all pushed aside when we went to go see Pooh Bear, they gave us free tickets! Everything was looking up again. The movie was good. The last time we went to see a movie was Bambi 2. Both of these movies were straight to DVD so the opportunity to see them in theatre was really nice. Because mom received word that all tickets were gone, we figured it would be really really busy but it wasn't. Just like Bambi 2, there were only about 20-30 people there. I watched the movie a bit but I just couldn't keep still. I had to wake up super early to go so that wasn't too fun. It really threw off my schedule. The movie was good though and everything turned out great. Daddy has been really busy at work this week. I guess his company has some big thing they are working on and he is in the middle of it all. The other night, we had to go to his office and we were there until 2:30 in the morning! In the morning! Lucky for me though, mommy is nice and comfy so I was able to fall asleep. Daddy however had to rush around all night working on things. It was crazy. Mom and dad are working with me on walking. I really want to start walking especially before my birthday party. I hear that mommy is having fun thinking of what to do. I hear that it's going to be a Mickey birthday cake. It's gonna be good! Little guys like me can only have white cake but that should still be OK. I can't wait to give it a try and smear it all over my face. I bet dad is gonna harass me with his camera. Hurrah. Written on August 17, 2006 by Kevin. Hectic work week results in short posts.. It was just a few weeks or so ago that I was commented on diapers and why the manufacturers are always talking about being super leak proof. I questioned this because of our experiences and the lack of leaky diapers. Without going into detail, Rylan's waste has changed significantly over the past month as he has begun to eat more baby food and solids. The result of all this? Blowouts. The little boy that would easily fill a diaper now can pop the seam and erupt. While this has not happened too much so far, we are taking measures to prevent it from happening again. This mainly consists of getting Rylan into size 4 diapers. They are just a bit bigger now that we hope to prevent this type of issue. 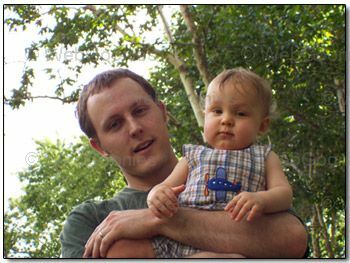 We have always been on top of the sizes and don't like to struggle putting on a diaper that is too small. Size 3 diapers however still fit Rylan just fine so we are having to re plan our upgrade strategies now. Over time you realize that there is no planning with a kid, you just have to wing it. Written on August 14, 2006 by Kevin. A month ago, my wife and I took Rylan for his 9 month checkup. This resulted in the doctor telling us that Rylan was way underweight and that we needed to start feeding him more baby food. While we didn't necessarily believe this to be the case as he was breastfed with some other foods, we took her advice and started feeding him others. Two things have happened over the past couple of weeks. One, Rylan has grown in size. He seems to have taken to the extra calories and decided that he will store it as fat. The doctor said that because he was moving around more, he needed the extra calories. He must not be burning them all off as he is slowly packing on the weight. Another thing that has happened recently is that Rylan has begun to look tanned. In fact, he has a hue of orange on his face. It appears that Rylan's new food is turning him orange. I recall my mother telling me stories about this as well but now I get to experience it first hand. We have moved Rylan onto a much wider variety of food colors now which appears to be helping. All in all, I think that we should have stuck with our gut instinct on this issue. While we want Rylan to be healthy, we believe that the doctor put too much fear in us when she said Rylan was in the 3-10% percentile for weight. From what we can determine, she does not believe in breastfeeding for more than 6 months. Her influence has now caused other issues such as a decrease in milk production for my wife. We are working on holding in there until Rylan hits a year and then begin to ween but it looks like nature is already taking its course. Written on August 11, 2006 by Rylan & Kaitlyn. Pooh Bear and the park. Last weekend was awesome! I had so much fun. 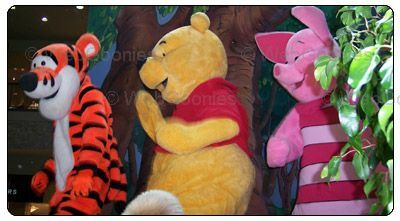 I had alot of fun seeing Pooh Bear and Tigger and even Piglet. 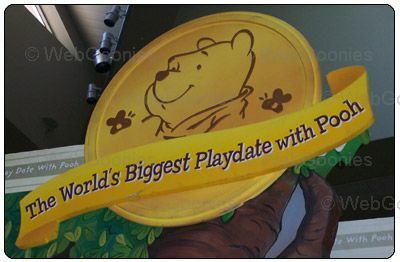 I don't recall seeing Piglet when I went to Disneyland in the past. I really liked it when they came onto the stage and were dancing around. I really got into the groove and was dancing around with the rest of the kids. 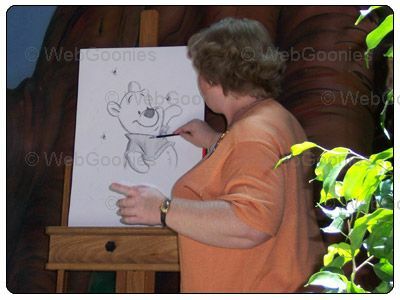 We won this awesome pooh bear drawing too, I couldn't believe it. They called off 5 ticket numbers with no one coming up and then finally they pulled my number. Talk about excitement. Speaking of excitement, parks are so fun. I got a chance to sit in a tunnel and chit chat with mom and dad. I like how it echos and I get really excited when dad comes and chases after me. We went to the mall last night and among other things, we stopped at their kids play area. It is filled with padded toys to climb over and through. Dad hunted down a tunnel to play in. Big kids were running around so fast. A couple of them nearly ran into me like I was a speed bump. Crazy kids! My standing abilities have increased significantly in recent days. I work myself into a standing position without dads help any more. Now it's onto making that first step. Mom and dad help me take some steps. I am getting the hang of things. Slowly but surely they always say. My mom and dad went ahead and bought a house. I was very happy to hear that I was moving with them. Of course, we won't be moving for a long time because they still need to build the house. It is much farther out of town than we currently are. I hope that everyone will still come to see me including my grandma and grandpa. It is going to take over a year to build the house so it will give people plenty of time to save up on gas money. I think that is all for now. I can't get over my weekend with Pooh. I wonder how dad is going to out do himself this weekend. Weekend fun at the park. Written on August 10, 2006 by Kevin. What do you do at a brand new park when no one is there? You have a good time without having to worry about being trampled by little kiddos. That is just what we did with Rylan this last weekend. 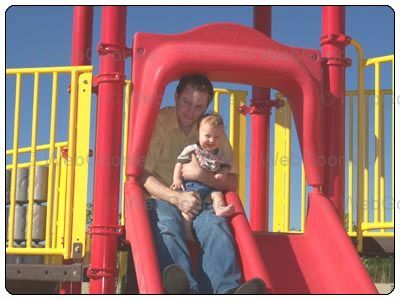 As if Rylan's date with Pooh Bear and gang wasn't enough, we took him to a neighborhood park that recently opened up. To our amazement, there was not a single person there in the middle of the day. The day was perfect with the skies a bit overcast. A great change from the scorching Arizona summer days. Rylan took full advantage of the park and we escorted him around. Previously dead asleep, he awoke to the challenge when he saw all of the new things to climb over and through. 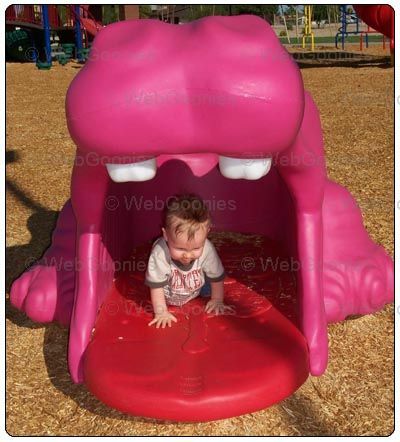 Despite the picture above, he did not have a great time on the slides. When he reached the bottom, he was more shocked than anything. When my wife took him down it a few times, he began to get worried and cried. The park had a few new toys that I was unfamiliar with including a small piano. It even included music to read and then to try and perform. This kept me and my wife entertained for a good 5 minutes. Who would have known. Rylan certainly seemed to enjoy it as well but my wife had to tell me to let Rylan do it. I guess I was butting into Rylan's playtime. Rylan's favorite spot was a small tunnel. He can't get enough of these. He seemed to enjoy standing up and grabbing onto the top to help guide him. A pink hippo finished up the day by slowly munching on Rylan. Lucky for us though, he spit him out gently. Nearly a week of downtime, or as I like to call it, a vacation. Blogging about Rylan's life and other blogs that I write can be time consuming at times. A vacation is always nice, even if has to come at the expense of a server outage. I want to thank Whaddu.com for working quickly towards a resolution. You took time away from your own child that was just born recently. Thanks alot. Written on August 3, 2006 by Kevin. Rylan has always shown extra strength in his legs so we really believed that he would be an early walker. I even went as far to say that he would be walking at 8 months. This did not happen and that's just fine by us. Over the past couple weeks however, he has shown real improvements. In fact, he has a new record of standing time. Roughly 23 seconds. Unfortunately, no one else got to see it but me. So I guess I could consider myself the lucky one. What is the best way to get a child to stand? Distract them. Rylan seems to be much more willing to stand when he is fixated on something. Whether that be food or a toy, he wont even realize that he is standing. This turns his legs from a jiggly mess to tough as steel. Everyone says to enjoy these days because he isn't too mobile and getting into trouble. Maybe this is the case but we sure are looking forward to his first steps. I guess many people would consider us naive first time parents. Think positive and good things will happen. We are awaiting the day. Written on August 1, 2006 by Kevin. My wife and I planned to get pictures of Rylan every couple of months but as normal parents can agree with, things happen and things are pushed aside. 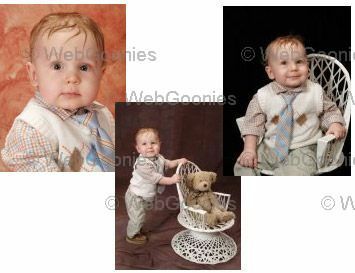 We finally got around to getting his picture taken though and had a great selection to choose from. We always go into the store thinking we are only going to buy one pose and then see the other ones. It always make choosing that one pose more difficult. We are lucky to have the ability to photograph Rylan every day while at home or out but it is nice sometimes to have someone else do the work and get a professional picture. Rylan did pretty well minus the fact that he wanted to grab at everything. Now we just need to take his 9 months foot prints, that should be fun.